Posted on 28, February 2018 by EuropaWire PR Editors | This entry was posted in Automotive, Germany, Marketing, Retail and tagged brand, digitalisation, marketing, Mercedes-Benz, MercedesBenz, retail, retail operations. Bookmark the permalink. The architectural concept of the showrooms contrasts with a silver-white roof or celling design thanks to a black interior landscape. Spatial boundaries within the building are kept to a minimum to deliberately create an open-space feeling. STUTTGART, 28-Feb-2018 — /EuropaWire/ — Mercedes-Benz is showcasing its new brand presence in the first showrooms. As the first international showroom, Hong Kong gives a thorough insight into the future world of experience. In Germany, customers can experience the new concept in Flensburg, where the brand with the star is showcasing how it will be experienceable virtually and in reality in future when the showroom becomes a stage. Within the context of the “Best Customer Experience” marketing and sales strategy, the premium brand is modernising its appearance in the exterior and interior area of its retail operations. In so doing, Mercedes-Benz is more strongly focusing on customers’ needs: the aim is to create a fascinating brand experience at the point of sale through a combination of spatial design, innovative advisory processes and the introduction of digitalisation in advice, sales and service. 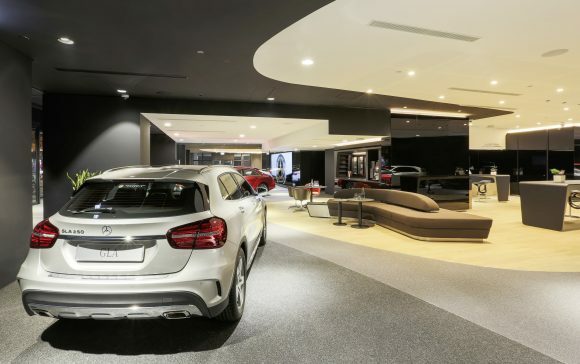 With its “Best Customer Experience” marketing and sales strategy, Mercedes‑Benz is further aligning its global sales and service for the future. With the new brand presence, the premium brand is redefining the role between the real and digital world in sales and service and is bringing together the benefits of both worlds. In so doing, the focus is on optimal customer care and a holistic brand experience of modern luxury from Mercedes-Benz. “With the new brand presence, we are creating an innovative world of experience for our customers. Through the combination of personal contact and digital elements in advice, sales and service, our point of sale becomes a point of experience,” says Britta Seeger, Member of the Board of Management of Daimler AG, responsible for Mercedes-Benz Cars Sales. This will greatly enhance the quality of personal advice: the discussion atmosphere between advisor and customer benefits from media that supports their dialogue as well as the new world of experience in the car dealership. All information relating to the vehicle becomes more tangible for the customer thanks to the new presentation forms. It’s not only customers who benefit from the new brand presence – it is also a clear sign for the approximately 6,500 Mercedes-Benz locations around the world. Bricks-and-mortar retail will serve as a personal point of contact for all customers and interested parties in the digital age, too, and will be a mainstay of Mercedes-Benz sales. In addition to virtual contact, there will always be a personal customer contact in future. In line with the philosophy of customer centricity, Mercedes-Benz focusses on customers and interested parties, offering them a premium brand experience across all points of contact. New job profiles for sales personnel are an essential part of the new brand presence. They ensure that the increasing product complexity and digitisation are taken into account, as well as the individual needs of customers. For example, the product experts explain the special features of the models and their technologies directly on the vehicle or on digital devices and screens to interested parties. The Star Assistant helps shape the entry into the Mercedes‑Benz brand world for the customer. The new job description also plays a key role: The Star Assistant is the first contact for the customer at the reception in the showroom. The customer’s concerns are clarified in a personal conversation. As part of the new reception situation, the customer is then immediately forwarded to the appropriate contact person for advice or a service or sales conversation. Setting up a drive-in service reception also illustrates the consistent alignment towards customer requirements and enables optimal customer care in combination with the integrated customer contact surfaces for sales and after sales. This has been demonstrated after just a short period of time in a clear increase in customer frequency. The new brand architecture is experienceable even when entering the showroom. In future, the entrance will be designed as a personal welcome gesture. The welcome and initial informal customer meeting take place at high tables grouped together in a relaxed manner. The customer experiences comprehensive care regardless of internal units. The new role of the Star Assistant as a host and the “first face” of the brand ensures a very welcoming atmosphere at reception. The concept is modular in design and is oriented to the needs of customers and interested parties. Thanks to their flexibility and variability, the brand presence’s individual elements allow a high degree of spatial applications and formats, and thus a consistently applicable CI/CD. This enables individual consultation and sales processes with a standardised global brand presence.